Pharmaceutical Sciences Division Professor Lingjun Li is researching biomarkers for early detection of Alzheimer's disease. Alzheimer’s disease is a common form of dementia, affecting about 5 million Americans and more than 15 million individuals worldwide. Despite its prevalence, however, many aspects of the disease’s development and progression are still poorly understood. With few known biomarkers, researchers have struggled to develop early detection methods or effective treatments. 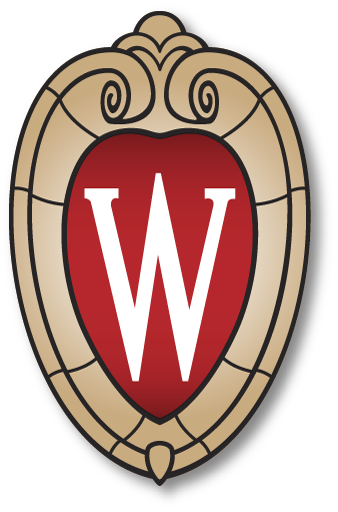 With a new $2.4 million R01 grant from the National Institute on Aging at the National Institutes of Health (NIH), University of Wisconsin–Madison School of Pharmacy professor Lingjun Li is taking aim at this problem using her strengths in analytical chemistry and biomolecular detection. She and a team of collaborators, including Cynthia Carlsson and Ozioma Okonkwo at the Wisconsin Alzheimer’s Disease Research Center (ADRC) and biostatistics professor David Page, are working to develop and deploy a suite of powerful tools to discover clinically relevant biomarkers to drive better early detection, diagnosis and, potentially, treatment of Alzheimer’s disease. One challenge with Alzheimer’s disease is that its early stages often go undetected. By the time a person shows behavioral and cognitive changes, their disease has likely already progressed to a more advanced stage where treatment may be harder or less effective. But some patients, for unknown reasons, never progress to more advanced dementia, Li says. It would be valuable to identify molecular signatures that could predict disease progression—and help patients get treated earlier. To look for early signs of the disease and to better understand how it progresses, her team will look at samples from four different groups of people: healthy middle-aged adults with a family history of Alzheimer’s disease, cognitively-normal older adults, and patients with either mild cognitive impairment or advanced dementia. The ADRC’s extensive collection of patient samples is an invaluable resource for exploring different stages of the disease, Li says. The researchers will look for biochemical signatures in the cerebrospinal fluid, or CSF. This is the fluid that surrounds and bathes the brain and spinal cord and which can be sampled via a lumbar puncture. Since CSF has direct contact with the brain, Li and her team think it holds the best chance of carrying molecular signals of early disease stages. They will analyze the samples using a technique called mass spectrometry, which sorts molecules by their weight and other chemical properties. Skilled researchers, like Li, can read the resulting patterns to identify which proteins are present in the sample. One of the powers of this approach is the ability to analyze the full range of proteins present. Unlike some analysis methods that require searching for a specific known molecule, Li says their approach opens the potential for true discovery. For their biomarker discovery, Li’s team will focus on a category of molecules called glycoproteins. These common molecules get their name from the glycans, or sugar-based chemical groups, stuck somewhere on a protein molecule. Tacking this kind of chemical group onto an already-existing protein is one of biology’s ways of using a limited number of proteins to do more things. Professor Lingjun Li in the Li Lab. Those sugar groups act almost like a language for cell-to-cell communication, Li says. The types of sugar groups and where they’re attached can have dramatic effects on proteins’ shape and how they work: how active they are, what they attach to, how far they travel and even the nature of the messages they carry. Changes in the sugars can also reflect whether a cell is healthy or sick. Abnormal glycosylation patterns have been implicated in cancer and neurodegeneration, including a role in the formation of protein tangles and plaques in Alzheimer’s disease brains. This makes glycoproteins particularly interesting candidates for early detection, Li says. But the same features that make glycoproteins so versatile for a cell can also make them very challenging to study. There are many different types of sugar building blocks and they can be attached in numerous locations and combinations, leading to a dizzying array of sugar-decorated molecules. Those subtle differences in molecular arrangement are hard for scientists to distinguish with most standard analytical methods. On top of that, the glycosylated proteins are active at low levels and don’t tend to stick around very long. Scientists haven’t had a good way to measure how much of each protein was present in a sample, just whether it was there or not. But, Li says, it may be important to know whether certain proteins accumulate or decrease during different disease stages. So Li and her team have had to get creative. They are pushing the capabilities of mass spectrometry to be able to find and distinguish even small amounts of similar glycoproteins. Part of the new grant will support their development of these more sensitive tools. They are also working on higher-volume processes to use with the clinical samples. 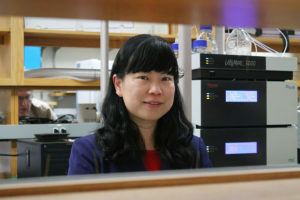 Li and her team are pushing the capabilities of mass spectrometry to find and distinguish even small amounts of certain glycoproteins, common molecules that act as a language for cell-to-cell communication. “We anticipate finding a panel of molecular features that may help us to classify different stages of disease,” she says. “We want to take the most promising candidates and develop a clinical assay” that can be used to evaluate patients. She hopes the same kind of assay, once developed, could also be used to test potential treatments. Li, her graduate students Tony Chen and Xiaofang Zhong and the ADRC team have already developed some preliminary protocols and, with the new funding in hand, are ready to launch on a larger scale. But to do so will require ramping things up. To find the kinds of signals they hope to see, they need to analyze hundreds of patient CSF samples, each containing potentially thousands of proteins. With standard analysis protocols, the time and money really start to add up. Plus, even the best machines can have a large degree of variability between sample runs, making fine-scale comparisons difficult. Fortunately, this is where Li’s background in analytical chemistry and instrumentation really get to shine. Her lab has been developing ways to layer multiple analyses into a single run, a process called “multiplexing.” They do it by adding small chemical “tags” to the proteins in a given sample. Li compares it to color-coding the proteins from different samples. That way, they can combine multiple samples in a single mass spectrometry run but still distinguish the samples in the data at the end. So far, they have created a set of chemical tags for a 12-plex, which is enough to analyze samples from the four different disease stages, each in triplicate, all in a single run on the instrument. Professor Lingjun Li, of the School’s Pharmaceutical Sciences Division. Now they are looking to increase the capabilities even further, possibly up to a 36-plex. 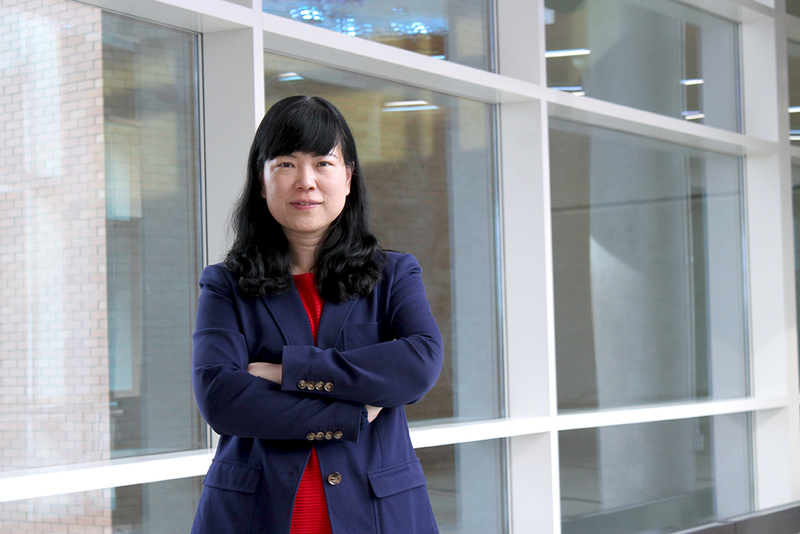 Li and her team are also exploring new ways to label molecules for high-resolution quantification and were recently awarded a UW–Madison Technology Innovation Fund grant to synthesize a novel set of high-efficiency chemical tags they call SUGAR tags. Once developed, these SUGAR tags can be licensed to help researchers using mass spectrometry in a wide variety of fields, Li says. Learn more about Dr. Lingjun Li’s research and the Li Lab.